Died November 27, 1969, Washington, D.C.
Today ends "Women in Horror Month," designed to celebrate artists, writers, filmmakers, and other women who have contributed to the horror genre. There is of course a subtle difference between weird fiction and its kindred genres of horror, fantasy, and science fiction. I'll leave it to someone else to draw the line. 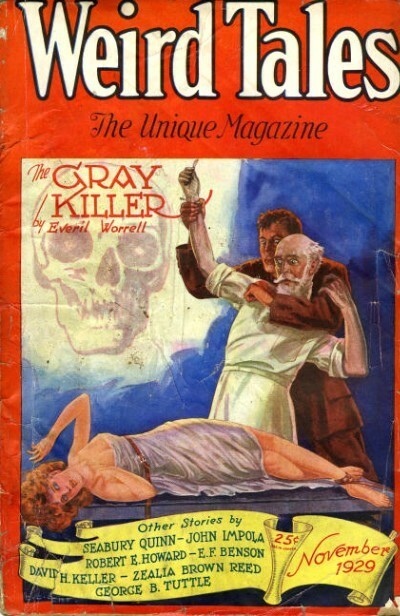 In any case, today, in observance of "Women in Horror Month," I would like to tell about Everil Worrell, one of the most prolific contributors to the magazine Weird Tales. In the 1970s, author, editor, and Weird Tales expert Robert Weinberg issued a series of six small, numbered volumes called The Weird Tales Collector. One of the highlights of the inaugural issue is a biography and bibliography of Everil Worrell, written by her daughter, Jeanne Eileen Murphy, and annotated by Mr. Weinberg. I can't top Ms. Murphy's account of her mother's life and work. Instead I'll just hit the high points. From birth, Everil Worrell must have been destined to write tales of the weird and fantastic. She was born at the witching hour, one minute after midnight on November 3, 1893, the day after All Souls' Day, or, in Latin America, the Day of the Dead. She was an only child and the daughter of a school principal, teacher, accounting auditor, and patent examiner. In her youth, she lived with her family in Nebraska, Iowa, Montana, Oregon, Guam, Washington, D.C., and finally Arlington, Virginia. Everil Worrell studied music, voice, literature, English, and psychology at George Washington University and the University of California at Berkeley and afterwards went to work for the U.S. government as a secretary and stenographer. Everil married Joseph Charles Murphy in early 1926. 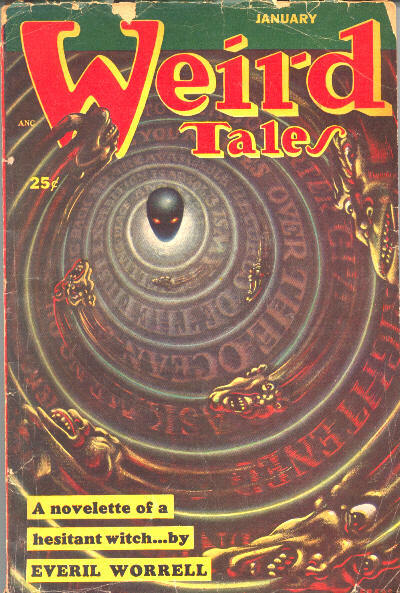 A few months later, Weird Tales published the first of her nineteen stories for the magazine. Her last appeared in the March 1954 issue, only a few months before Weird Tales gave up the ghost, thus giving her one of the longest tenures with the magazine. Eighteen of those stories were under her own name. One--"Norn"--appeared under the byline "Lireve Monet." 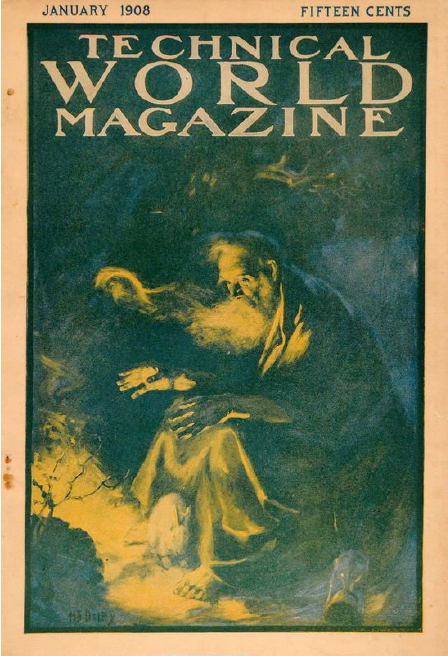 (1) Everil also wrote a number of letters to "The Eyrie" and contributed to other fantasy magazines, including Ghost Stories ("The Key and the Child," Oct. 1930; "None So Blind," Mar. 1931) and Mystic Magazine ("The White Gull," Aug. 1955). Several of her stories were reprinted in later collections, and one--"The Canal"--was adapted to television in an episode of Rod Serling's Night Gallery. In addition to being a writer, Everil Worrell played the violin, sang, painted, and joined a number of clubs, including the League of American Pen Women, the Writer's League of Washington, and the Society of Free Lance Writers. While living in Washington, D.C., she also met with others who wrote for or were fans of Weird Tales, including Julius P. Hopkins, Seabury Quinn, Bruce Bryan, Earl Pierce, Jr., and William and Elizabeth Foster. 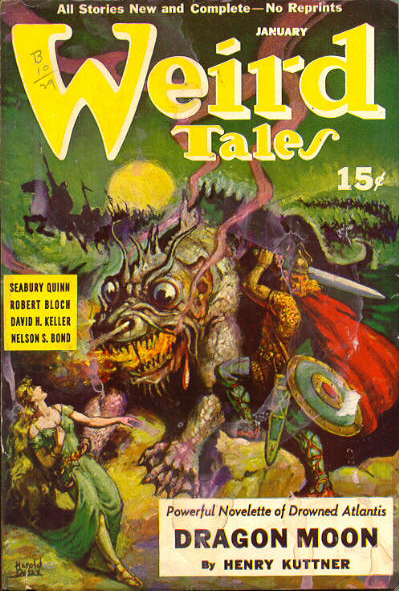 She, like countless others, "was broken hearted when Weird Tales folded in 1954." Everil Worrell retired on the last day of 1957 and received the Albert Gallatin Award from the U.S. Department of Treasury for her years of service. She died eight years later, on Thanksgiving Day, 1969, at age seventy-six. Her daughter described her as "a wonderful person and a wonderful mother," adding "she left much beauty and goodness behind her and I know she will always be safe with God." (1) Lireve is Everil spelled backwards, while Monet is an adaptation of her mother's name, Manatt. In The Weird Tales Collector, Robert Weinberg wondered whether the name O.M. Cabral could have been her pseudonym as well. According to Wikisource, O.M. Cabral was the American author Kenneth MacNichol (1887-1955). 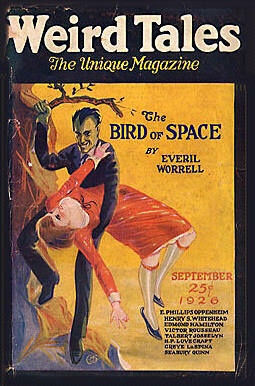 Finally, Everil Worrell's nineteen stories for "The Unique Magazine" would place her among the top twenty-five or thirty authors in terms of prolificacy. Several of Everil Worrell's stories have been reprinted in paperback and hardbound anthologies. A simple Internet search will yield plenty of results. 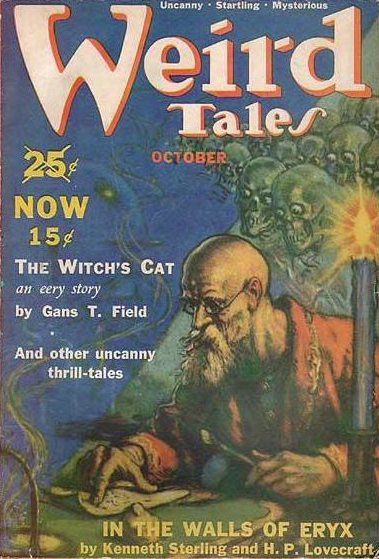 Everil Worrell wrote nineteen stories for Weird Tales and made the cover three times. From top to bottom: "The Bird of Space" (Sept. 1926), art by E.M Stevenson; "The Gray Killer" (Nov. 1929), art by C.C. Senf; "Once There Was a Little Girl" (Jan. 1953), art by Frank Kelly Freas. 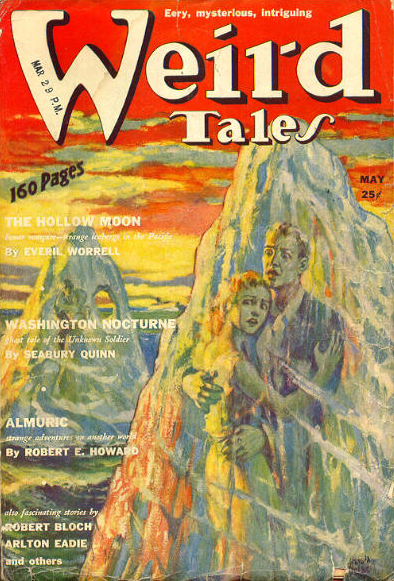 Everil's daughter recounted that her parents "had the walls of their apartment decorated with the art work for her stories and the covers of issues of Weird Tales. When I was born (in 1928), however, they thought they'd better take the pictures down because they didn't want to frighten the baby!" Kelsey Percival Kitchel was born on October 6, 1881, in Perth Amboy, New Jersey, where her father practiced dentistry. She was an adventurer even as a young woman: in May 1905, she returned to New York City from Puerto Cortés, Honduras, on a ticket she had purchased herself. What drew her to Latin America at the time is an open question. She would later return with her husband. Kelsey P. Kitchel began writing at a young age. 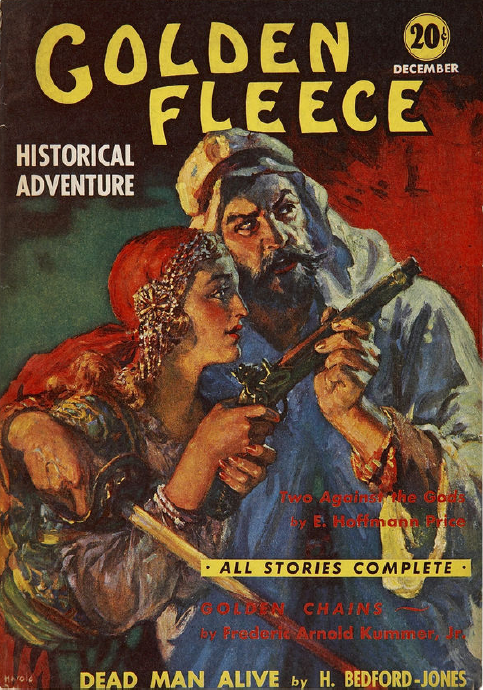 Her earliest credit that I have found was called "Pirate Treasure," a short story published in Pearson's Magazine in June 1909. Even after she had married, she wrote under her own name. Magazines that printed her stories and poems included Adventure, The All-Story, The Crisis, Ghost Stories, Gunter's Magazine, Prairie Schooner, The Smart Set, Tropical Adventures, and Young's Magazine. A story for The Crisis, "The Rains," was set in Jamaica. 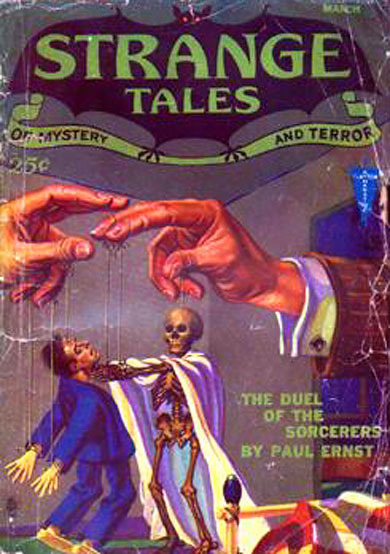 Her lone contribution to Weird Tales, the short story "Mummy," was set in Chile. Kelsey Kitchel lived in both places with her husband, and thereby hangs a tale. Howard Green Bayles (1881-1948), descended from a very early immigrant to America, was the son and brother of engineers. His father, James Cooper Bayles, was an author, the first editor of Iron Age magazine, and president of the American Society of Mechanical Engineers. Howard Bayles' brother, Lewis Condit Bayles, was a mechanical engineer and holder of more than fifty patents for his inventions. Howard Green Bayles married in 1905. His first wife was an actress, Janette Logan. The marriage was short-lived, however, for Janette divorced him in 1908, charging her husband with "misconduct with Beatrice Culbert, an actress, on April 30, 1907." (The quote is from the New York Times. Incidentally, Janette Logan Bayles was later subject of a lawsuit herself, when--as an heir to a mining company--she was sued for the alleged misconduct of her benefactor.) That divorce cleared the way for Bayles' marriage to Kelsey Kitchel, which took place on January 19, 1910, in Newark, New Jersey. Before the year was out, the newlyweds were on their way to Latin America, where they would spend the next seven years of their lives and where their first born came into the world. Kelsey P. Kitchel's story for Weird Tales, "Mummy" from November 1929, reads like a tale told around a fireplace late at night. It takes place in a desert mining camp and in a nearby village and its ancient graveyard. The narrator is a man, a mining engineer, recently of New York and New Jersey. The man is nothing more than a grave robber and subject of retribution from the grave. It's a brief but effective tale, reprinted in 100 Creepy Little Creature Stories in 1994. It's clear that the author drew from her own experience and from the men whom she knew, for Kelsey Kitchel Bayles lived in Chile from 1914 to 1918 while her husband worked for the South American Export Company. In all, she and her husband seem to have spent seven years overseas, in Mexico, Jamaica, and Chile. By 1920, the Bayles family had returned to the United States, living first in Norwalk, Connecticut, later in Houston, Texas. Howard Bayles worked as an insurance agent while his wife continued to write. Bayles authored a book of his own, The Bayles Families of Long Island and New Jersey (1944), and a supplement in 1946. He passed away two years later. In that same year, Kelsey Percival Kitchel Bayles contributed an article about her family to American Genealogist. She survived her husband by almost two decades and died in Ocala, Florida, on July 8, 1967. She was eighty-five years old. That made my whole heart love you so. Did my soul seek to do your will. It was the soldier's soul of you! "Mummy" by Kelsey Percival Kitchel appeared in this issue of Weird Tales with a cover by Curtis C. Senf. The cover story is by Everil Worrell, subject of tomorrow's posting. Senf's illustration is a variation on an inexhaustible theme: the eternal triangle of the damsel in distress, menaced by the fiend (or monster), and near rescue from the valiant hero. Kelsey P. Kitchel (1881-1967) and her husband, Howard Green Bayles (1881-1948), from their passport applications. Thanks to Randal A. Everts for providing Kelsey Kitchel's birthplace and death date. Over the course of his six-decade-long career, Elton Clay Fax made notable contributions to American culture and society and left his mark in communities around the globe. As an author, artist, and educator, Fax earned himself a place among the most celebrated of black Americans of his time. Born on October 9, 1909, in Baltimore, Maryland, Fax attended Claflin College and the College of Fine Art at Syracuse University, where he earned a bachelor of fine arts, graduating in 1931. He began his career as a lecturer and art teacher at Claflin College in Orangeburg, South Carolina, in the 1930s. 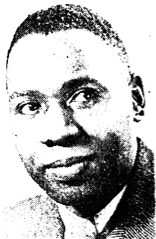 He was a prolific artist, illustrating more than thirty books and a multitude of magazine articles, and he produced the weekly comic strip Suzabelle, which ran in several black newspapers during the 1940s. He was also an accomplished writer who travelled extensively throughout the United States and abroad, researching his books on black life and culture. During his illustrated lectures abroad, Fax brought news of the American Civil Rights Movement to other peoples. He held formal positions as a U.S. Department of State International Exchange Program Representative in South America and the Caribbean, a delegate to the International Congress of Society of African Culture in Rome, and a lecturer with the U.S. State Department in East Africa. No matter where his other commitments and interests led him, Fax never lost sight of his calling as an educator, teaching courses in colleges and universities throughout the United States, lecturing in schools around the world, and conducting workshops and talks for children in schools and community centers. He held teaching, guest lecturer, and artist-in-residence positions at several colleges and universities over the course of his career, including a residency at Purdue University in West Lafayette, Indiana. Readers of Weird Tales would have recognized the names of Jameson, Miller, Burks, Boucher, Kuttner, Moore, del Rey, and Asimov, all of whom contributed to "The Unique Magazine." Fax followed up his work for science fiction magazines with illustrations for Weird Tales in four stories from 1944. By the way, Fax should not be confused with Matt Fox, who started working for the magazine at about the same time. After a long and distinguished career, Elton Clay Fax died at his home in Queens, New York, on May 13, 1993. He was eighty-three years old. There is abundant reading on Elton Clay Fax on the Internet and in reference books of art, artists, and famous black Americans. I will list his books in a future posting. 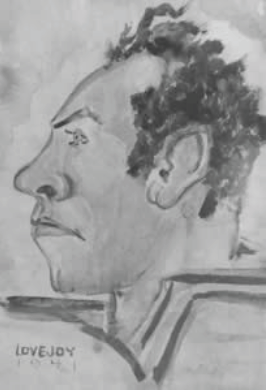 Renowned author, artist, and educator Elton Clay Fax began his illustration career in science fiction magazines. 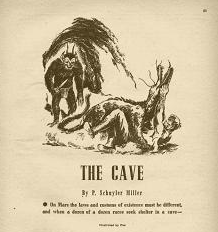 The image is small, but here's an illustration for "The Cave" by P. Schuyler Miller from Astounding Science-Fiction, January 1943. This drawing in ink, of President Franklin D. Roosevelt, shows Fax's facility with a pen and with portraiture. In later years, Fax turned to weightier subjects, such as famine in Africa. The title of this piece is "Bread," and it was part of a series of lithographs called "Black and Beautiful," executed between 1964 and 1968. From the collection of Temple University. 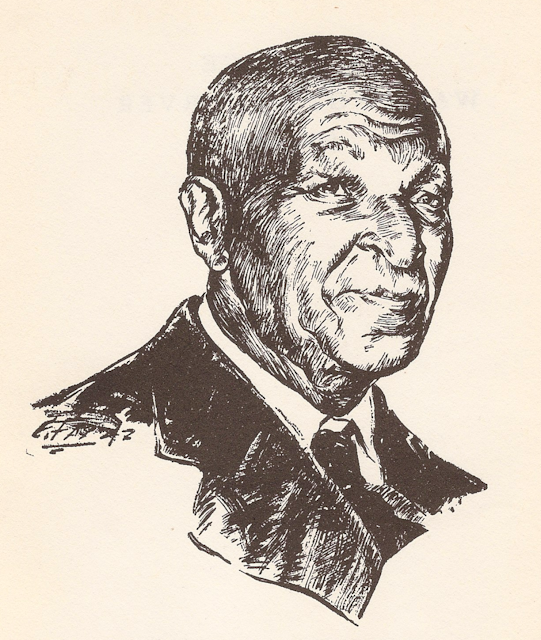 Postscript: A portrait of George Washington Carver from the second book illustrated by Elton Clay Fax, Dr. George Washington Carver, Scientist (1944). I set out to write brief biographies of the authors and artists who contributed to Weird Tales magazine, and more often than not, I am confounded by the fascinating complexity and connectedness of their lives. The case of Alston Lovejoy would seem simple enough at first glance. A Google search for that name renders few results. It would appear Alston Lovejoy was just another of the now obscure names who wrote for Weird Tales. Then a snippet from an academic journal opens up his life, for Alston Lovejoy was better known as Ritchie Lovejoy, the writer to whom John Steinbeck (1902-1968) donated his $1,000 Pulitzer Prize award for The Grapes of Wrath and who was part of Steinbeck's circle in Monterey from the 1930s onward. I'll leave Lovejoy's life story to someone who can tell it with full knowledge and intimacy, his son, John Lovejoy (named for Steinbeck), who wrote an article called "The Man Who Became a Steinbeck Footnote" for the Steinbeck Review in Fall 2008 (Vol. 5, No. 2, pp.59-84). I'll simply cover some interesting facts here. Ritchie Lovejoy was born on the first day of the year 1908 in Mountain View, California. His father was a fruit farmer, his mother the daughter of a prominent California architect, George W. Page. Lovejoy worked as a journalist in Monterey and Alaska, as a copywriter, author, artist, illustrator, and cartoonist. Perhaps he met his wife, Alaskan Natalya "Tal" Kashevaroff, while in Alaska. Her sister Sasha married one of Lovejoy's associates, the novelist, historian, conservationist, and explorer Jack Calvin (1901-1985). (Calvin wrote an account of a canoe trip he made up the inland passage, from Tacoma to Juneau, in the July 1933 issue of National Geographic.) In 1930, Lovejoy was living in San Francisco and employed as an artist. By the end of the decade, he was ready to give up work as a copywriter upon receiving Steinbeck's gift of the proceeds from his Pulitzer Prize. Lovejoy may never have fulfilled the promise implied by Steinbeck's gift. His novel Taku Wind was completed (contrary to the previous version of this posting) but never published. His one credit for Weird Tales was a story called "Thrice Dead," published in November 1929 when Lovejoy was just twenty-one years old. 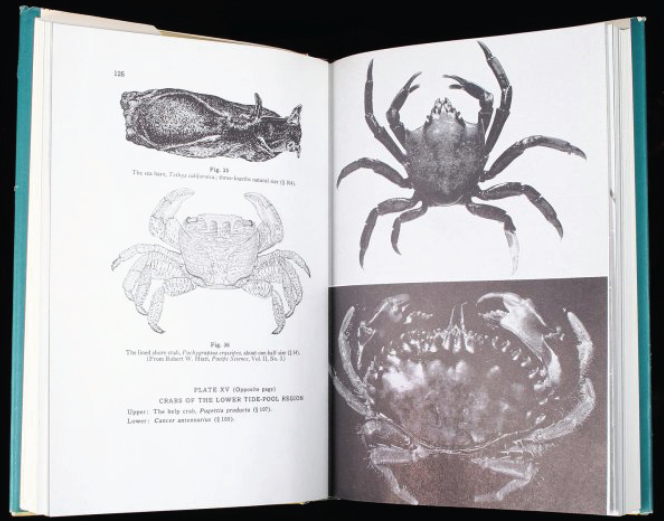 However, Lovejoy illustrated a classic of ecology, Between Pacific Tides, by Edward Ricketts (1897-1948), Jack Calvin, and, in later editions, Joel Hedgpeth (1911-2006). Coincidentally, the book was published in the same year as The Grapes of Wrath. Among the others in Steinbeck's circle in the Monterey area were Henry Miller (1891-1980) and Joseph Campbell (1904-1987). Most of these men outlived Ritchie Lovejoy, who died on July 10, 1956, in Monterey. "The Man Who Became a Steinbeck Footnote" by John Lovejoy in Steinbeck Review, Fall 2008 (Vol. 5, No. 2, pp. 59-84), as well as various publications on Steinbeck's life and work. Ritchie Lovejoy's portrait of John Steinbeck, his friend and benefactor. And a two-page spread from Between Pacific Tides (1939), illustrated by Lovejoy in collaboration with friends and associates from the Monterey area. 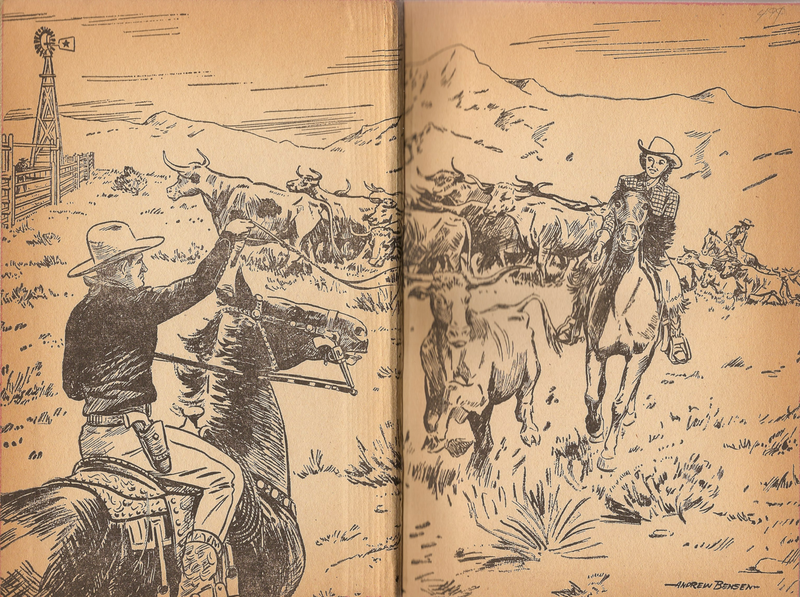 In later years, Andrew Bensen illustrated Westerns tied to television and movie stars. According to the Grand Comics Database, Bensen drew comic book stories for Dell's Roy Rogers Comics in the late 1940s and early 1950s under his own name and under a pen name, Al McKimson, which he shared with other artists, including the brothers Chuck and Tom McKimson, Pete Alvarado, John Ushler, Randy Steffen, Hi Mankin, Mike Arens, and Alex Toth. Other cartoonists who worked on Roy Rogers Comics included John and Sal Buscema and Russ Manning of Tarzan fame. Bensen's adaptations for books included Roy Rogers and the Ghost of Mystery Rancho by Walter A. Tompkins (1950), The Spirit of the Border (1950), also by Tompkins, and Gene Autry and the Golden Ladder Gang by W. H. Hutchinson (1950). (2) All three books were published by Whitman Publishing, a subsidiary of Western Printing and Lithographing Company of Racine, Wisconsin, which at the time was about halfway through its long partnership with Dell Comics. 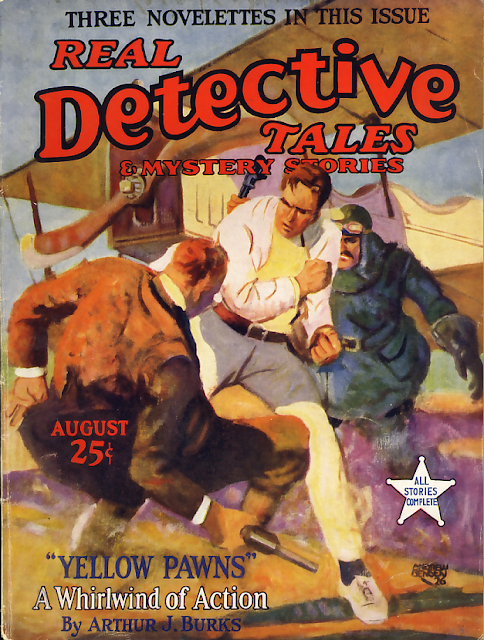 (1) Coincidentally or not, the cover stories for both issues were by Arthur J. Burks. Burks' story for Weird Tales was set in the West, thus all of the artwork I have found by Andrew Bensen is in the Western genre except for the aviation illustration shown below. (2) Walter A. Tompkins was a prolific author of Westerns whose credits included scripts for The Lone Ranger and The Cisco Kid TV series. William Henry "Old Hutch" Hutchinson (1911-1990) was another of those characters who helped build this country and who are sadly disappearing from our midst. Wrangler, cowboy, boiler fireman, mucker in mines, purser on passenger ships, U.S. Navy man during World War II, author, producer, teacher, and newspaper columnist, Hutchinson was even nominated for a Pulitzer Prize. 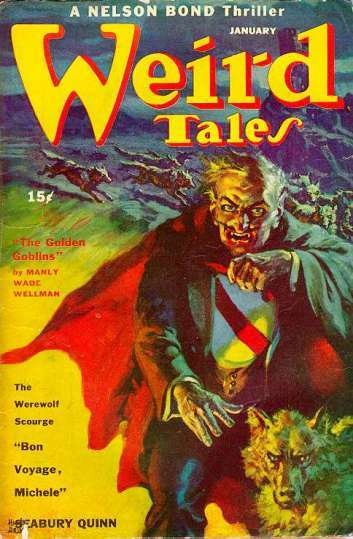 (3) In keeping with two recent themes in Tellers of Weird Tales: First, Andrew A. Bensen was a Scandinavian-American contributor to "The Unique Magazine." Second, Walter A. Tompkins was evidently a radio operator and wrote stories in the "radio adventure" or "radio pulp" sub-genre. I wish I could point the way to further reading on Andrew Bensen, his life, and his career, but I'm afraid I couldn't find anything. I hope a reader will have more to offer. Update (Dec. 7, 2018): See Bensen's obituary in the Cardunal Free Press, Carpentersville, Illinois, January 8, 1976, page 6. 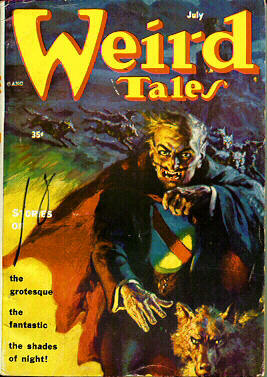 Andrew Bensen's lone cover for Weird Tales (May 1926) is not widely known and can be hard to find. It didn't appear in Robert Weinberg's Weird Tales Story (1977) or Alistair Durie's Weird Tales (1979). It's not easy to find a reproduction on the Internet either. I think I know why, for Bensen's illustration is completely lacking in weird or fantastic elements. It could be the cover for any pulp magazine. The endpapers of Gene Autry and the Golden Ladder Gang by W. H. Hutchinson (1950). Note the artist's signature in the bottom right. Updated October 21, 2016, and December 5, 2018. I can't offer much more about the life and work of S. Omar Barker than what has already been written about him except for a couple of pieces of trivia. Born in a log cabin in the mountains of the New Mexico Territory, Squire Omar Barker, the youngest of eleven children, was named for his father. He attended high school and college in Las Vegas, New Mexico, and graduated from New Mexico Normal University, now New Mexico Highlands University. In his youth, Barker was a forest ranger, a school teacher and principal, a college English instructor, a newspaper correspondent, and a state legislator (1924-1925). I suspect that he would have crossed paths with the pioneering conservationist Aldo Leopold (1887-1948), who was stationed in New Mexico with the U.S. Forest Service between 1911 and 1924. Barker was also a trombone player in Doc Patterson's Cowboy Band, and he served with the U.S. Army in France during World War I.
S. Omar Barker, also known as Omar S. Barker, was a prolific writer of poems, short stories, articles, and novels. He even cowrote a cookbook. By his own estimate, Barker produced 1,500 short stories and novelettes, 1,200 articles, and 2,000 poems. He won several awards, honors, and recognitions. My favorite is the title of "Poet Lariat of New Mexico." Titles of magazines that printed his work would fill up more than one blog posting. Here's a sampling: Adventure, Argosy, Far West, Lariat Story Magazine, The Saturday Evening Post, Street and Smith's Western Story Magazine, Triple-X Western, Wild West Weekly, and Zane Grey's Western Magazine. If you want a different kind of genre fiction, you might try his story "Back Before the Moon" from Strange Tales of Mystery and Terror (Mar. 1932) or his poem "Moon-Marked" from Weird Tales (Jan. 1948). "Back Before the Moon" was reprinted in Great Ghost Stories of the Old West (1968) and Magazine of Horror (Summer 1970). Barker began writing full time in 1925 and in 1927 married another writer, Elsa McCormick (1906-1987). Like her husband before her, Elsa attended New Mexico Highlands University and taught school from 1930 to 1971. In addition, she wrote stories for Ranch Romances and for syndication through King Features. (1) Her books include Riders of the Ramhorn (1956), Cowboys Can't Quit (1957), Clouds over the Chupaderos (1957), Showdown at Penasco Pass (1958), War on the Big Hat (1959), and Secret of the Badlands (1960). Incidentally, Omar Barker's older brother, Elliott S. Barker (1887-1988), was also a writer, though he spent most of his working life in the out-of-doors as a guide and outfitter, forest ranger, rancher, and game warden. In 1950, as state game warden, Barker was instrumental in drawing the attention of the U.S. Forest Service to a small black bear cub that had been burned in the Capitan fire in his home state. Although the forest service had been using Smokey Bear as its mascot for fire prevention since 1944, there wasn't a real Smokey until Barker and others sent the young cub to the National Zoo in Washington, D.C., as a gift to the school children of America. (1) The Fiction Magazines Index website seems to have conflated her credits with those of another woman named Elsa Barker, giving her dates as 1869 to 1954. (2) Star Trek is the only other series in this category that I can think of offhand. Theodore Sturgeon, Robert Bloch, and Frederic Brown were all contributors to that show. 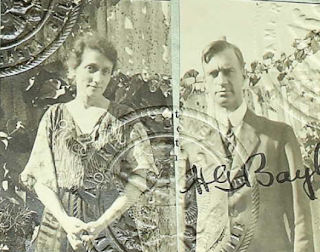 There are sources all over the Internet for information on S. Omar Barker, Elsa McCormick Barker, and Elliott S. Barker. You might start with a website called "Western and Cowboy Poetry, Music and More at the Bar-D Ranch," here. I have lots of images for S. Omar Barker, or "S.O.B.," as he was known. I'll start with the cover of Strange Tales of Mystery and Terror from March 1932, in which his story "Back Before the Moon" appeared. 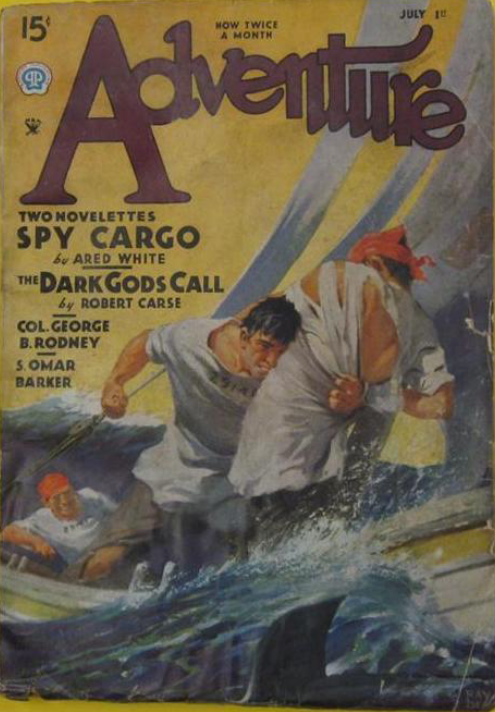 Next, Adventure for July 1, 1935, with Barker's byline on the cover. The artist was Ray Dean. Barker was best known for his Westerns. 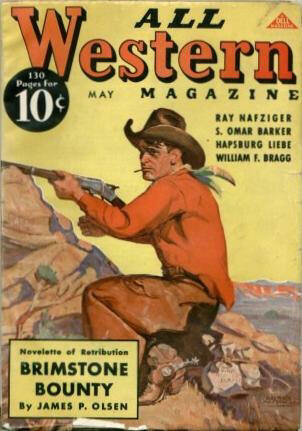 Here's a cover for All Western Magazine for May 1937, again with his byline. 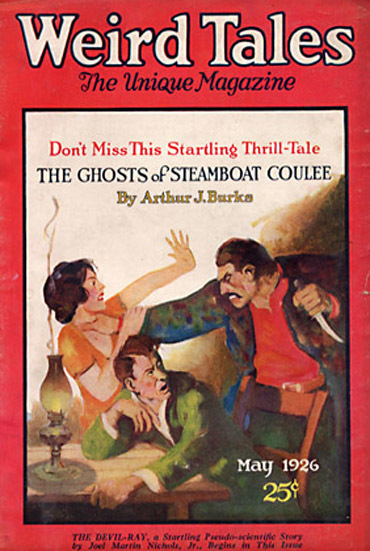 Barker didn't limit himself to stories strictly for men. 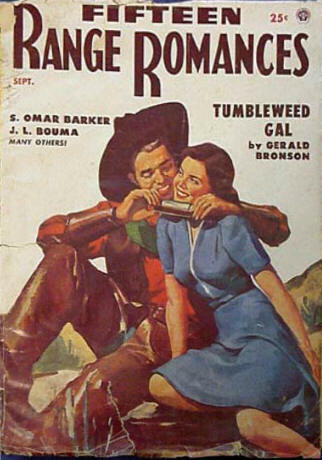 He also tried his hand at Western romance, as in his story for Fifteen Range Romances in September 1954. Barker's wife, Elsa McCormick Barker or just Elsa Barker, also wrote Westerns. 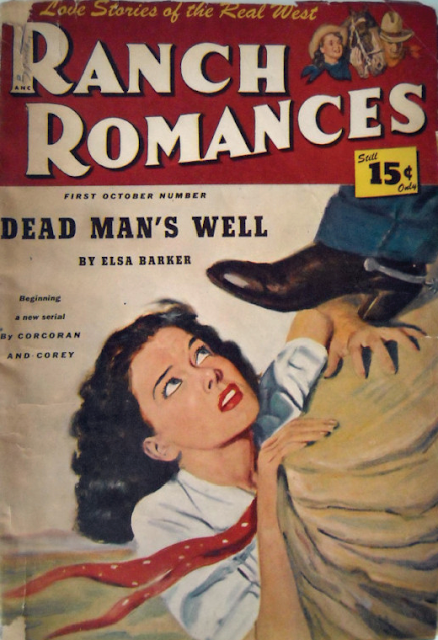 Her name was a fixture on the cover of Ranch Romances for many years, as in this cliffhanger from September 17, 1948. 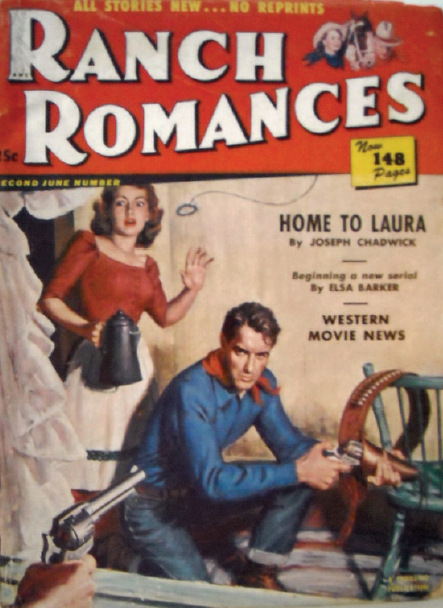 Ranch Romances, June 20, 1952, "Beginning a New Serial by Elsa Barker." When I look at covers like this one, I wonder why we ever gave up on classic illustration. Rounding out the Barker family authors was Elliott S. Barker, Omar's older brother. 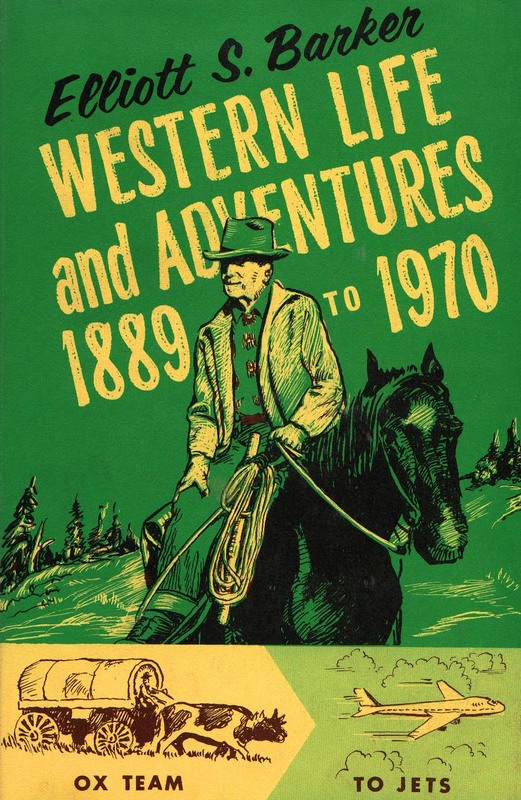 Here's the cover of his memoir, Western Life and Adventures 1889 to 1970. 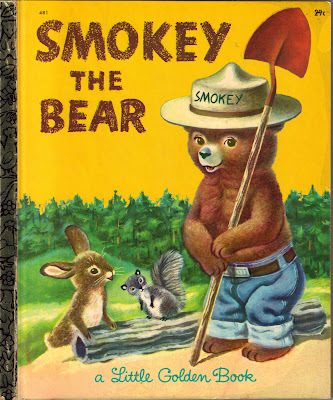 Elliott S. Barker played his part in the story of the real Smokey Bear, a small black bear cub burned in a New Mexico forest fire in 1950 when Barker was state game warden. The story was retold in this Little Golden Book by Jane Werner Watson and illustrated by Richard Scarry (1956). Squire Power built a spacious house on his large farm in the 1850s. Among his guests was Stephen A. Douglas, Lincoln's opponent in the presidential election of 1860. Power's son William was also a judge who just happened to hear Abe Lincoln's last case in Sangamon County before he became president. Upon Squire Power's death, the Power farm passed to another son, James Power, thence to James' son Charles, and finally to June Power, James' daughter. Arminta June Power was born on May 20, 1885, probably on the farm near Cantrall, Illinois. Her father was James England Power, her mother, Laura Cord Power. On June 24, 1903, just past her eighteenth birthday, June Power married Frank Creveling Reilly (1870-1945), a railroad agent and heir to a fortune, in Chicago. By the time a county plat book was published in 1914, June was in possession of a farm of over 600 acres in Fancy Creek Township in Sangamon County. June Power Reilly wrote one poem for Weird Tales, "Why Was My Dream So Real?" from July 1935. I have also found a poem (below) about her home in the Sangamon River country of Illinois. Intentionally or not, June's poem echoes the meaning of the Pottawatomie name Sangamon: "where there is plenty to eat." As was her due, June Power Reilly was a member of the Daughters of the American Revolution. In 1960, she and her local chapter placed a historical marker at the courthouse where Abraham Lincoln tried his first case, located on the Power farm. June Power Reilly died on January 4, 1973, and was buried in Springfield, Illinois. 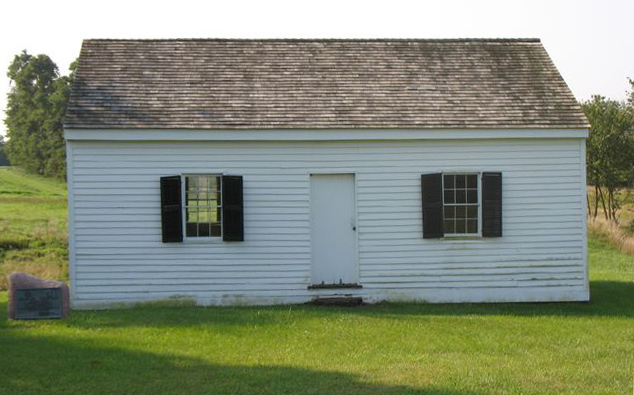 A chapter on "Fancy Creek Farmhouse" from Old Illinois Houses by John Drury. A description of historical markers placed by the Springfield, Illinois, chapter of the Daughters of the American Revolution. The obituary of Virginia Reilly Glore (1906-1994), The Missouilan (Missoula, MT), August 16, 1994, p. 11. They cannot take from you your memories. Once a narrow Indian trail. You held out your hand in welcome. You guided them to the river. You whispered, "On to the land of plenty!" And wearied by the noise of many motors. You dream and long for the early days . . . . But they cannot take your memories. (1) From Old Illinois Houses by John Drury (1941, 1948). 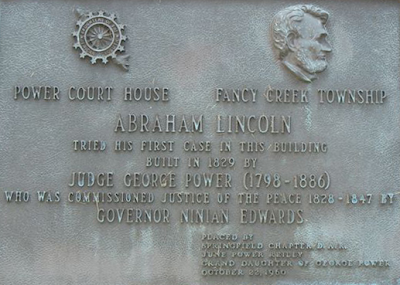 The courthouse and marker on the Power farm near Cantrall, Illinois, the building where Abraham Lincoln is supposed to have argued his first legal case before Squire Power, grandfather of poet June Reilly Power. 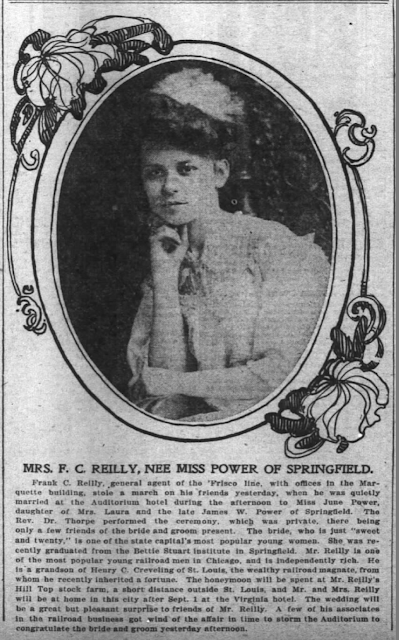 Update (July 8, 2018): A photograph of June Power Reilly on the occasion of her wedding to Frank C. Reilly, June 24, 1903, in Chicago. From the Chicago Inter Ocean, June 25, 1903, p. 2. Revised slightly January 6, 2019. Thanks to Randal A. Everts for June Power Reilly's place of death. Harold Saylor De Lay was born on May 13, 1876, in the west central Ohio town of South Charleston and attended the Art Institute of Chicago with Ada and Adolph Schultz, Karl Albert Buehr, Henry Hutt, J.C. Leyendecker, and other artists who went on to their own successful careers. De Lay exhibited student works in 1895 with some of them. 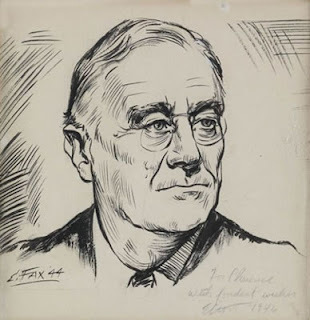 By the first decade of the twentieth century, he had embarked on a career as a fine artist and commercial artist, initially illustrating books and magazine covers. Some early credits include illustrations for Technical World Magazine, 10 Story Book, Thirty-One Years on the Plains and the Mountains by William F. Drannan (1900), Life in the Mines by C. H. Simpson (1908), With Lyon in Missouri by Byron A. Dunn (1910), The Quest of the Silver Fleece by W.E.B. Du Bois (1911), The Short-Stop by Zane Grey (1914), and "646" and the Troubleman by Charles H. Oliver (1916). De Lay also contributed five illustrations to the novel Daughters of Destiny (1906) by Schuyler Staunton, a pseudonym of L. Frank Baum, creator of the Wizard of Oz series. 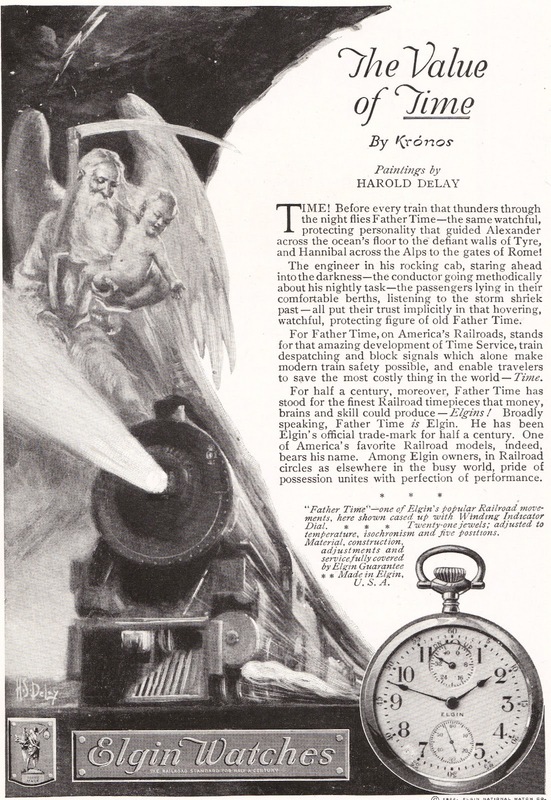 De Lay created several illustrations for Elgin Watches in the 1920s. He also did illustrations of Biblical scenes in a series of prints. 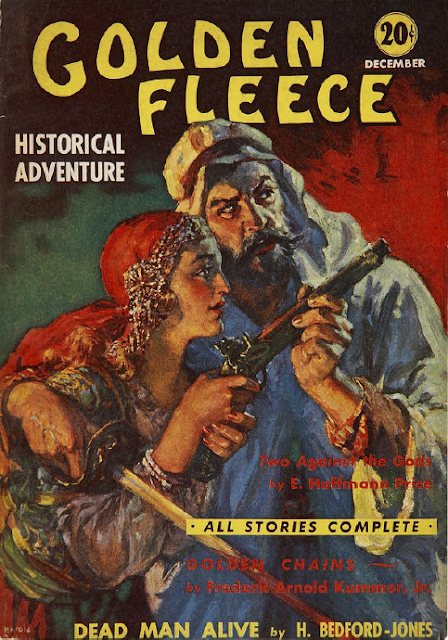 During the 1930s, he worked for pulp magazines, providing several covers for Golden Fleece and Weird Tales. 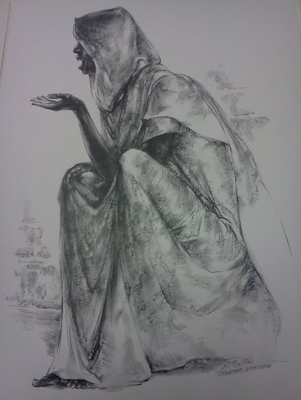 He also drew black-and-white illustrations for the interior of Weird Tales from 1936 to 1939. 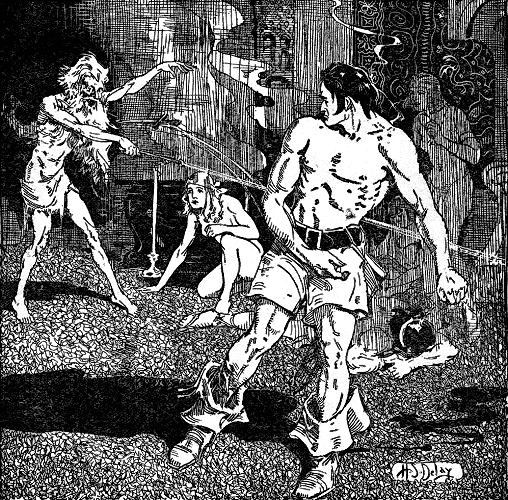 According to Jaffery and Cook's Collector's Index to Weird Tales, his first interior illustration was for "Black Canaan" by Robert E. Howard, a story that appeared in the magazine in the month Howard killed himself, June 1936. Comic book fans will be glad to know that Harold De Lay also wrote, pencilled, and inked comic book covers and stories while working for Funnies, Inc., from 1939 to 1947. Titles included Blue Bolt, Fantoman, Funny Pages, The Human Torch, Mystic Comics, Target Comics, and True Comics. De Lay also adapted Treasure Island to the comics. De Lay settled in Winnetka, Illinois, early in the twentieth century and appears to have lived there for several decades with his wife, Austria Reath (or Roath) De Lay, and their many children. His granddaughter reports that he left his family in the early 1930s and moved to Astoria, Queens, New York. See her comment below. Harold De Lay died on August 14, 1950. His work has been reprinted in several books in recent years. An early magazine cover from Harold S. De Lay. It looks like De Lay used the same model for this advertisement for Elgin Watches from the 1920s. 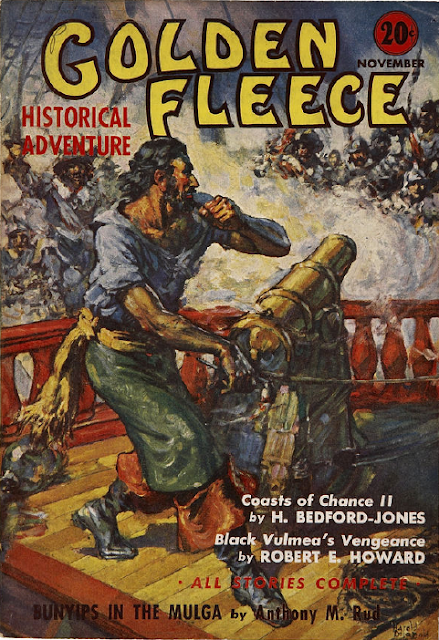 Three covers for Golden Fleece showing that De Lay was equally adept at illustrating stories of the Orient, the high seas, and ancient Rome. 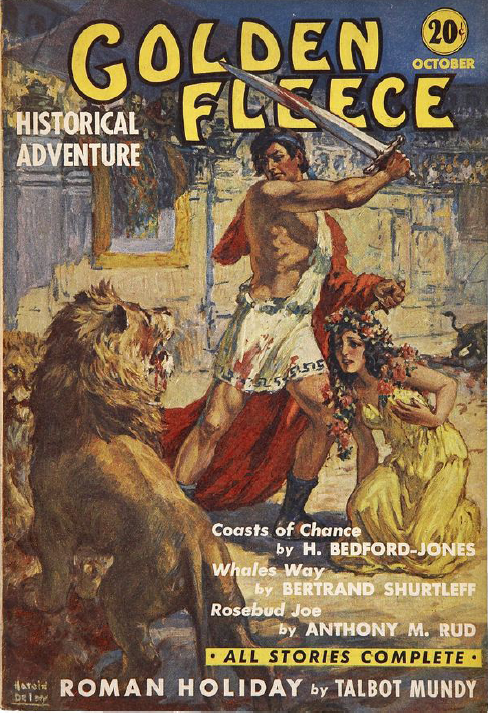 Most of the authors listed on these covers--E. Hoffman Price, Frederic Arnold Kummer, Jr., H. Bedford-Jones, Robert E. Howard, and Anthony M. Rud--also wrote for Weird Tales. De Lay was also one of the first artists to draw Robert E. Howard's Conan of Cimmeria. Here is an interior drawing from Weird Tales illustrating "Red Nails" from 1936. Harold De Lay created four cover illustrations for "The Unique Magazine." His last appeared on the front of two issues, January 1944 and the penultimate issue, July 1954. This painting was also used for the cover of the hardbound collection Weird Vampire Tales (1992). Thanks to Randal A. Everts, Judy Pharo, and the commenters below for additional information.